The CEA team has a great commitment to educate the current and the next generation of practitioners in the realm of energy systems analysis. 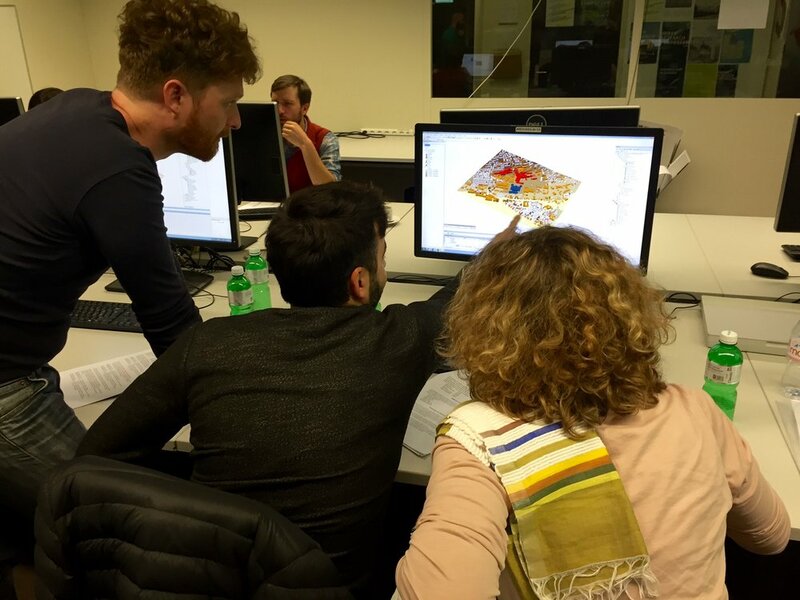 We aim to train groups of students, researchers as well as experienced consultants in the forefront of techniques for the analysis of urban energy systems. The executive course will provide an introduction to urban energy systems analysis theory and practice with the City Energy Analyst (CEA). In hands-on exercises, the participant will learn how to use advanced numerical methods to estimate and optimize the performance of real urban energy systems. The participants will examine the techno-economic potential of strategies ranging from building retrofits, renewable energy integration, and district energy. Participants were invited to take part in the first public CEA workshop as part of the 2016 Sustainable Built Environment (SBE) conference held at ETH Zurich. The two-day session consisted of theoretical input, as well as individual and group work. The participants came from a wide range of backgrounds from design-based disciplines to engineering, and ranging in position from PhD student to assistant professor. The main objectives of the workshop were to present the tool to a diverse audience and check its role in creating synergies between various scenarios in an urban context. The workshop also aimed to assess the user friendliness of the tool as well as its importance in the field. While the theoretical content of the workshop was generally considered adequate, a large number of participants expressed interest in a longer workshop including a detailed analysis of the calculation methods. Regarding the tool itself, a majority of the participants rated the tool’s user-friendliness and their likelihood to use the tool again positively. The City of Zurich is looking for a vision of an extended campus in the city center. Urban planners worked on designing this area for about a decade. In 2014, the so called Vertiefungsstudie, a study on possible core design proposals, was published. 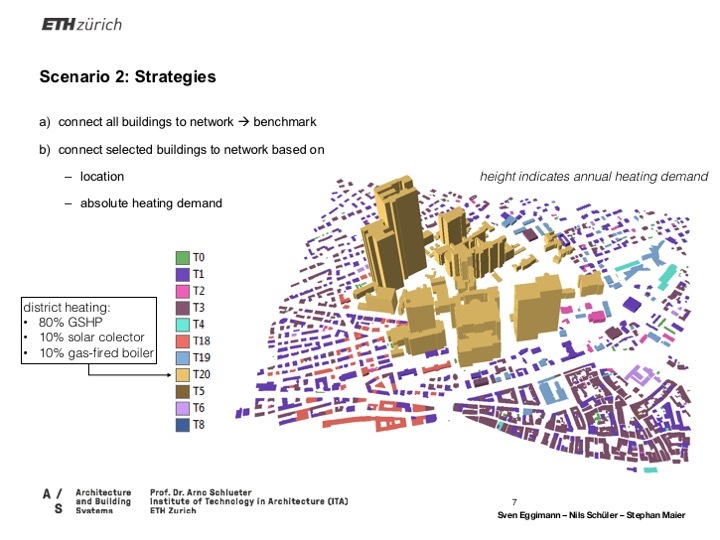 The site contains three main actors: The University Hospital (USZ), the University of Zurich (UZH) and the Swiss Federal Institute of Technology in Zurich (ETHZ) along with other, mainly residential-use buildings. 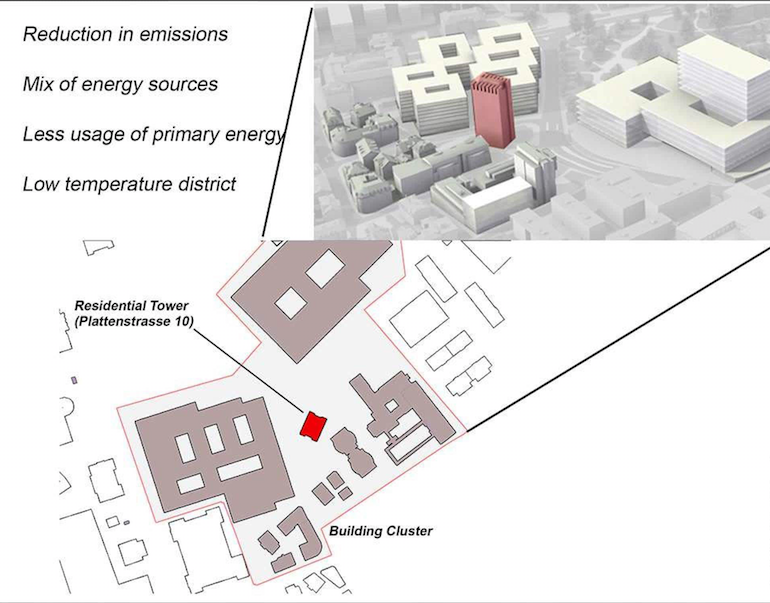 Students of the Master in Integrated Building Systems (MIBS) were asked to first analyse the status quo in terms of energy supply and emission systems, building typologies, geometry and age, local renewables as well as local climate and context. This allowed students to get a comprehensive overview of the study area, its problems, constraints and potentials. Following this analysis, each group got to choose a site – either a brownfield (here, students will have to design a new building) or a site that is already occupied by a building (in this case a retrofit concept is to be developed). Finally, students were asked to design a building on the selected site and assess its performance, incorporating the previously developed energy analysis. Throughout the whole process, students looped back to evaluate their proposals, rendering a continuous relationship between designing on the urban and building scales. The main goal of this course was to develop synergies and designs that focus on enhancing the energy performance, reducing CO2 emissions and fostering sustainability of a city quarter.